Companies that take a more sophisticated approach to customer success, revenue retention and revenue growth after the initial sale earn 46 percent more revenue compared to their less sophisticated peers, according to a global study conducted in 2015 across software, hardware, SaaS and life sciences companies. The study highlights the urgent need for companies to consider the full range of customer success and revenue growth activities after the initial sale—collectively called the “revenue lifecycle”—which includes onboarding, adoption, upselling/cross-selling, retention and renewal. 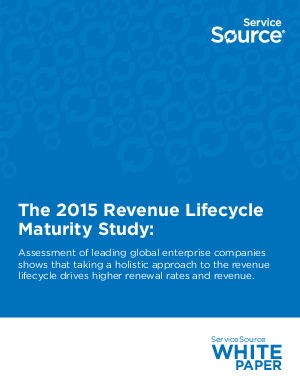 The study shows that a company that improves people, processes, technology, data and KPIs in the revenue lifecycle can expect to improve renewal rates by more than 31 points.